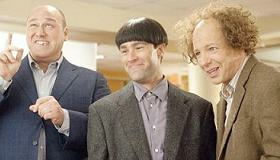 It may sound sacrilegious, but Peter and Bobby Farrelly have done right by comedy icons The Three Stooges with a film—contemporary in tone, but retro in spirit—that actually feels like something the original Stooges might have made themselves, if they were alive and in their prime circa 2012. Split into three distinct segments, much like the trio's classic slapstick shorts, this compact comedy is from nyuks to yuks side-splitting fun that will have you laughing from start to finish. Placing the Stooges in a Catholic orphanage they never quite outgrow, even as 30-something adults, the Farrellys—clearly loyal and loving fans themselves—have honored three comic legends by bringing them back in style to a whole new audience. Women, notoriously reluctant to embrace the Stooge brand of slap-in-the-face humor, may not bite but males of any age should respond in decent numbers even though true box office success is a likely longshot as the Stooges are an acquired taste. For us, these Stooges are still the kings of comedy and much easier to take than the Jackass gang whose extreme humor was obviously inspired by—if not up to the standards of—Larry, Curly and Moe. Over the years, this long-stalled project has been a dream of the Farrellys and perfectly matched to their own comedic sensibilities. Names like Jim Carrey, Benecio Del Toro and Sean Penn were bandied about and attached at one time, but smartly this version relies on the perfectly cast (if not so starry) trio of Sean Hayes as Larry, Will Sasso as Curly and Chris Diamantopoulos as Moe. Starting at birth and graduating to young lads, the Stooges are established as a group of orphaned kids joined at the hip in solidarity and stupidity. They're taken in at a orphanage run by a group of nuns led by Jane Lynch that includes Jennifer Hudson, bikini model Kate Upton and Larry David (yes, in drag). A quarter of a century passes and they're still there, never chosen by any parents and now earning their keep as handymen. When the orphanage runs out of money, the Stooges go into action trying to earn enough cash to keep it going. This leads them unwittingly into an ill-conceived plot where the conniving Sofia Vergara hires them to put a hit on her husband. Along the way, Larry and Curly find themselves at odds with group leader Moe who splits the group to become the newest cast member of Jersey Shore (don't ask, just go with it). Hayes, Sasso and Diamantopoulos are dead ringers for the original Stooges and true to their origins. Purists may balk, but the real Moe Howard, Curly Howard and Larry Fine would be proud of their perfect mimicry. Quite frankly, the latter day Stooges were never as funny in their feature length films as these guys manage to be. And the supporting cast is well chosen with everyone including nun Larry David playing it all with a straight face. Cameos from the Jersey Shore cast are a riot and bring a fresh, current tone to the merriment. Sure you could just go and rent the original DVDs, but this kind of gut-busting, hit ‘em in the groin humor is still funny as hell, especially in the hands of the Farrelly Brothers. And bring the kids. The filmmakers have included a coda at the end where two muscle-bound actors posing as the Farrellys warn impressionable kids not to try any of these violent gags at home. Rating: PG for slapstick action violence and some rude and suggestive behavior including language.